Taking care of our little’s is one of the most important jobs that we have. When they are happy, we are happy. When they are sad, so are we. No one likes to see little kids sad, their hurt just breaks your heart. But when their hurt is something that you can fix, there is some relief. Having top of the line products in your parental arsenal is a MUST. Diaper rash is part of life. Every kid has had it, and of course we parents dread the inevitable. When my son was young, he suffered the WORST diaper rash ever! It turns out that he was having a reaction to something in one of the diaper brands that we were using. But until we figured that out, having a diaper rash cream that we could rely on was amazing! I have trusted Desitin for years! Johnson and Johnson gave parents a little piece of heaven with this cream. No diaper bag, changing table, or vehicle should be without it. You can even leave some at the grandparents houses, just to be on the safe side! You might laugh, but I am going to tell you – Desitin can be used for so many other things – not just diaper rash! Small rashes, dry skin, etc., I have used it! Last year when I had an allergic reaction to some medication (fun times) I popped some Benadryl to counteract the effects, and then I used Desitin on the hives that broke out. It helped to lessen the hives, and at the same time begin to heal my skin. Head on over to your local commissary and stock up now. Don’t forget to check your Beauty and Baby app for savings! View this video to see just how much Desitin can help your little’s and their bums feel better. 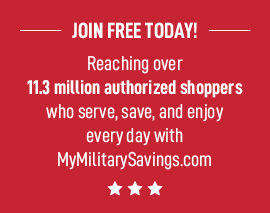 Then check out www.mymilitarysavings.com for even more savings from Johnson and Johnson and our other favorite brands!